Over the years of writing these columns a number of truths have become evident, one of which is never write about irrigation ditches, churches, architects and railroads because one can research them all ’til hell won’t have them, and you’ll still be wrong. Another, ranking right up toward the top, is that Sparks, to Reno’s east, is a cool city, had the coolest chicks in Washoe County in 1959, has the best place to watch Hot August Nights revelry, has the Sparks Hometowne Parade with Santa every year, has the Farmers’ Market all summer, the Marina, the best (and biggest)) city manager in the lower-48 in Shaun Carey [when I wrote this originally], John Ascuaga need-we-say-more, and, a museum. Which Reno doesn’t. 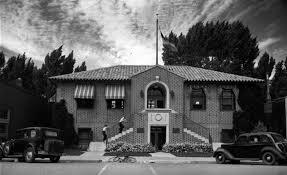 So I say to my Sparks buddies who rag on me for not writing about Sparks, read the chapters in my book about Ascuaga’s shark, (which is still thriving in San Francisco’s Steinhart Aquarium), about the Nugget flagpole sitter and about Sparks’ fire department – and one of their chiefs who died in the RENO 1948 Lake Street fire. I do write about Sparks. And a few weeks ago on this web a photo of a Sparks fireman and a link to the Man On The Bench, a column I wrote that I’m proud to say is in the FDNY’s firehouse that gave it all on 9/11. I like Sparks, and make no bones about it. Ergo, whatever that means, this week we are going to learn more of Sparks’ museum – the Sparks Heritage Museum on Victorian Way, with great parking behind it and a thousand stories to tell, and most of them relevant to kid of all ages, and not just the ones growing up in Sparks. I’ve written about the formation of the museum, of the guys like Carl Shelly and Tom Swart who got the thing going. And tonight as I write I’m betting that maybe we’ll get a few folks to go to the Rail City and enjoy the museum! 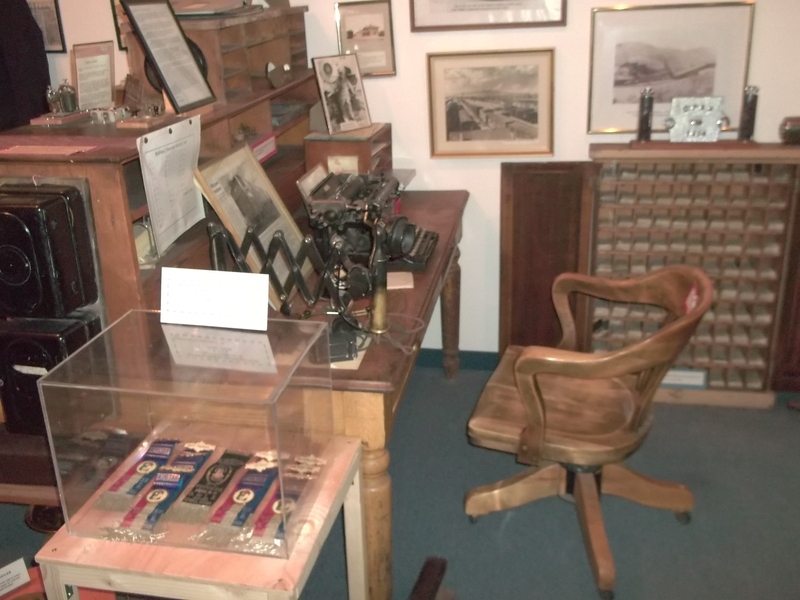 The museum, pictured above, is in an old county building that was originally built in 1931 for the Washoe County Library’s Sparks branch, note Harry Scheeline’s name on the plaque, Scheeline the hotshot banker of that era. The little brick building, attributed to architect Frederic Delongchamps but I’m standing clear of that, became the Sparks Justice Court in 1966 – the domain of the legendary judge Jack Lamberti, one from the family of great Sparks residents spanning several generations, most of them railroaders. 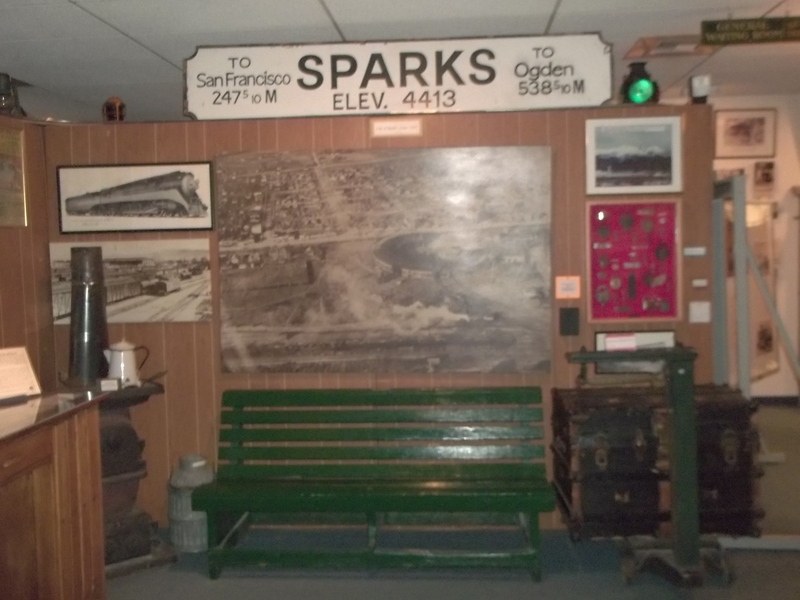 The stuff in the museum is to some degree a story of railroading – from Sparks’ earliest heritage with photos and artifacts and hardware and displays of the tools of railroading, and ranks right up with the artifacts in the California State Railroad Museum in Old Sacramento. I would think that the Sacramento museum would give their eye-teeth for some of Sparks’ displays – and the close-up, hands-on presentation in Sparks. Check out the telegrapher, one of several displays in Sparks using mannequins. His desk probably mimics one in the Sparks of the 1900s. And the photos on the walls – one could take hours just looking at the artwork! But it’s not all railroad – we’ll see some more railroad photos, like the clock that once was evident in downtown Sparks, a Ball clock that kept time with remarkable accuracy and was available in the window of W. R. Adams & Sons Jewelers on B Street – now Victorian Way – in Sparks. 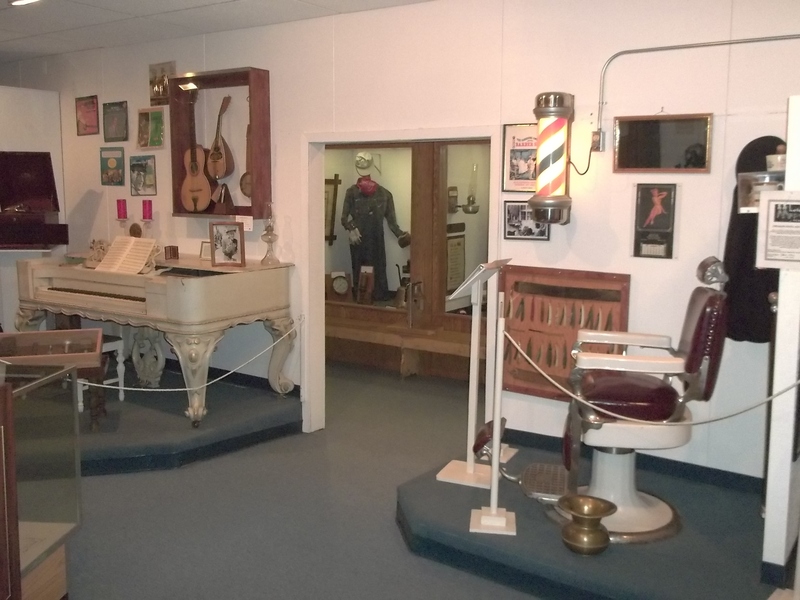 The Sparks Heritage Museum is one of the best-kept secrets in the valley – its displays mimic not only the railroad heritage of Sparks, but the lifestyle of our towns in turn-of-the-20th Century, early photos of the Nugget, the agricultural endeavors around the area. They are volunteer-based, get no money from any governmental agencies and do one hell of a job. 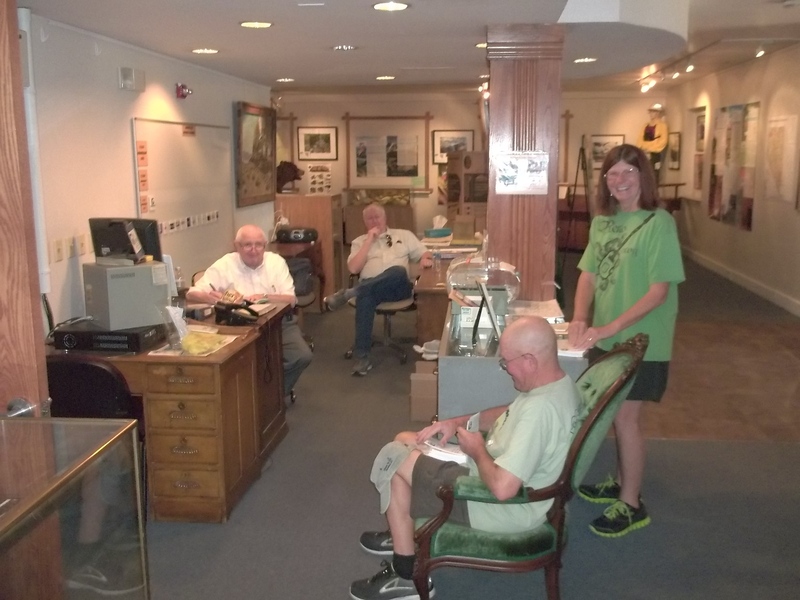 Next time you have friends in town, or kids that would like to see the way we were – the volunteers would love to show you around! 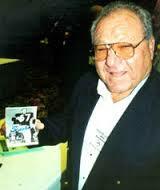 I met Don Manoukian in the Fall of 1952. I was a freshman at the still-new Reno High School, and, at 13 years old the youngest kid in school. My sister (now, Marylee Fulkerson) was a Junior and a classmate of Don’s sister, Jackie (now,Powers). Don’s younger brother, Noel, was a peon-Freshman like me. We Freshmen spent time wondering if those Seniors were really going to be pushing us into the hallway lockers, as was widely rumored. (They didn’t.) In those days, First Period was “Home Room” and we all sat in alphabetical order, a natural meshing of the Manoukian and Metzker youngsters. To say that Don was god-like probably understates the situation–he was god. He was captain of the Huskie football team, holder of the state record in the shot put, honor student and President of the student body. And – much more importantly – he would stop and talk to me in the hallways. You’ve probably heard the expression “shining with reflected glory”? Well, that was me with my Freshman friends. “Hi, Johnny. How ya doin’?” He would say. He was so kind and generous. Looking back, I can see that his reaching out was intentional. In 1983, my family planned a family-only, 80th birthday dinner for my father at San Francisco’s St. Francis Yacht Club. I had arranged for a “mystery guest speaker” – Don Manoukian. I have to add that my mother’s sister’s side of the family was (and still is) somewhat more refined and mannerly than my mother’s side of the family. Don said that he would fly down for the night and insisted that his expenses be his birthday present to Dad. Anybody who has ever listened to a Don Manoukian program will not use the adjectives “refined or mannerly” in their description of the presentation. Don, by then, had known our family for decades and knew some juicy tidbits to bring up. His comments that evening were somewhat bawdy – and to some members of the family, somewhat shocking. Don Manoukian was truly one of my life heros. I am so glad that I made it a point to tell him that on more than one occasion. And I’m sure that the account of that bulky football player riding his motorcycle into the Stanford library wearing nothing but a jock strap was just malicious gossip. On Oct. 31, 1864, Nevada joined the Union, and the 36th star was added to the American flag to represent the new state. As part of Nevada’s 150-year celebration of statehood, the Nevada Museum of Art has assembled a major show with the clever title of “The 36th Star: Nevada’s Journey from Territory to State.” The show includes exhibits borrowed from the National Archives, the Nevada State Library and Archives, State Museum and State Parks. This historic showcase of Nevada’s beginning history is underwritten by the E. L. Wiegand Foundation. Some of the earliest documents on display include Territorial Gov. James Nye’s letter describing the promise of Nevada. Among other attributes, Nye stated that cities were springing up like “gourds in the night,” a reference to gourds that bloom only at night. He mentioned the state’s valuable assets of mining, agriculture and lack of debt. President Abraham Lincoln needed a copy of the state’s constitution before he could proclaim Nevada was a state. Fittingly, four of the 44 pages of the original state constitution are on exhibit. Two copies of the complete document were sent to Washington, but neither copy arrived in time for the presidential election to be held on Nov. 8, 1864. Lincoln believed he needed the votes from a new state to be reelected. Since neither copy arrived, the state telegraphed the document to Lincoln. The thick 175-page telegram is displayed in its own showcase, and Nevada’s records for transmitting the telegraph also are in the case. Once the telegram was received, Lincoln signed the Proclamation of Statehood on Oct. 31, 1864, and this document is in the exhibit. While a replica of the Emancipation Proclamation that abolished slavery, signed by Lincoln, is in the exhibit, the original five-page document will be at the museum from Oct. 30 to Nov. 2 and on display for a limited number of hours over the four-day period. Related to the proclamation is Gov. Henry Blasdel’s letter dated Feb. 16, 1865, to Lincoln, notifying him that Nevada had ratified the 13th Amendment abolishing slavery. 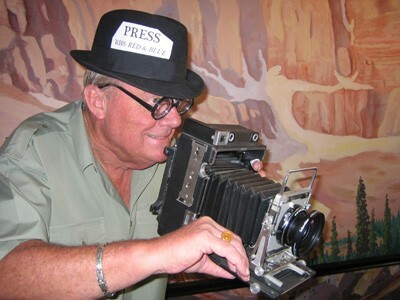 The show includes photographs from one of the three most famous Civil War photographers. Two sets of certain Timothy O’Sullivan’s photos are on display. In the first group are pictures of the Civil War, and the second group contains some of the earliest photographs of Nevada between 1867 and 1872. Various artifacts in the show include three 36-star flags; a map of the boundary between California and the Nevada territory in 1863; a photo and sword of the Commander of Fort Churchill Joseph Stewart; the Muster Rolls of the 1,200 men who volunteered during the Civil War and served in Nevada; a navy blue soldier’s coat of a Nevada volunteer; and Blasdel’s photograph, engraved cane and pocket watch. In a place of honor in the show and on loan from the Nevada Historical Society is the Gridley flour sack auctioned off to raise more than $275,000 for the wounded Civil War soldiers. Reach Patty Cafferata at pdcafferata1@sbcglobal.net and http://easternslope publisher.com. The article on Virginia Lake needs a follow-up, plus a rational “Save the Lake” committee! Reno is known for its ability to raise money for causes. Here is an excellent one. When we came to Reno in 1958, the lake was beautiful. The island had three majestic Weeping Willow trees, and, yes, children played in the lake at the south end, which had a beach that you could walk on with bare feet, or in the Cochran Ditch that supplies the water to the lake. There is no way that anyone could go into the ditch with bare feet today. Wood Ducks nested in the trees on the west side of Lakeside Drive. We watched their tiny ducklings dropping from the trees and scooting across the road to the lake, where they thrived. Loons came to the lake in the fall, stopping on their migratory path. Then the cormorants, not a native bird, moved in and nested in the willow trees. In a few short years, their toxic droppings killed the trees and created a barren, guano covered mound in the lake. Now we have ducks and geese dying from the toxicity, and environmentalists saying that we need the lake for the cormorants. Not so! 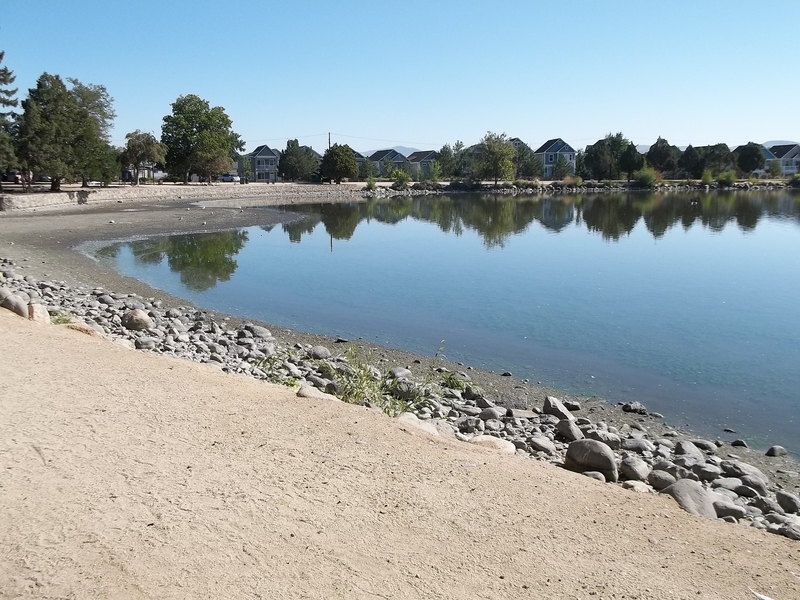 You noted that Virginia Lake has been drained twice. We remember when it was drained in 1965. All kinds of things were found, including (as I remember) an old safe, at least one motorcycle and bicycles. Almost 50 years have passed since the lake was drained. This is an opportune time to empty the lake once again, dredge it, repair the fountains – and the sidewalks around the lake – and re-establish a tree covered island. I doubt if any type of plant could live on the Virginia Lake island now, and I cannot even begin to imagine what kind of “yuck” or artifacts would be found if the lake is drained. Local archaeologists could be enticed to see what they could make of what would be found after the 50-year hiatus. Perhaps the old island could be removed and a new island built in its place. This could be a “Works Project Administration – WPA” project for the Biggest Little City. How to get rid of the cormorants? Yes, they are interesting to watch, but look at what they have done to the beautiful lake, one that used to be non-toxic. If there is no lake, they will go elsewhere. They are among the opportunists in the bird world. The best idea would be to drain the lake now, and leave it to dry over the winter. Once it dried, it could be cleaned out, then refilled when water is again available. Last Saturday’s elegiac paean to the Liberty Belle, as predicted, provoked a near-unprecedented stream of memories, running the gamut from hilarious to poignant. All are saved; nothing goes to waste in the ol’ writer’s garret and they’ll be trotted out soon – when I can get them all into one pile. Er, file. There arrived among these contacts some peripheral restaurant notes not associated with our Belle Farewelle specifically, in these cases memories of other favorite now-bygone restaurants, or their signature dishes. 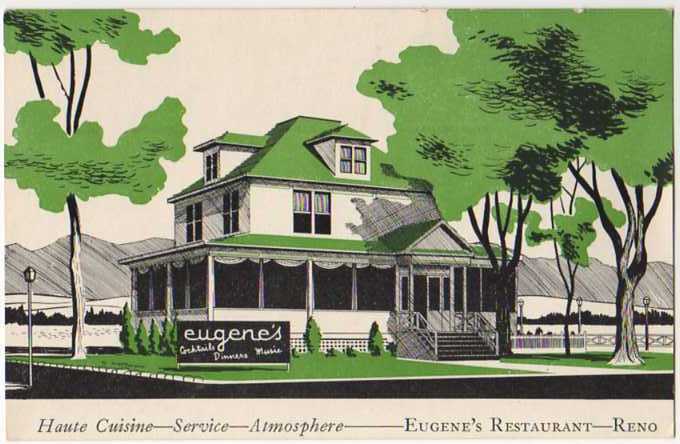 I’m reminded of two 2001 back-to-back columns – merged into one in my earlier “Mapes” book – about Eugene’s restaurant, a Reno classic that closed two decades before. Following those columns I was accused by not one but three, which approaches all, readers of writing-for-food, which is to say, “Write something nice about a restaurant and then pick up a free dinner in return.” These readers were probably unclear on the concept that for a columnist to realize a freebie meal out of any joint, which I’ve never done in 24 years, it’s mandatory that the joint be open for business at the time of publishing the compliment. 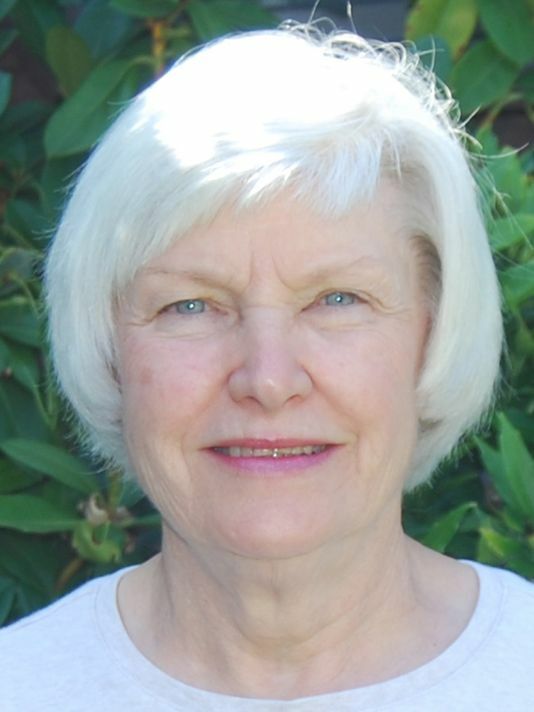 These three readers have since moved on to the RGJ’s Contract Bridge or the fascinating “Patents” column that appears in the main news section,, both of which use large-print and single-syllable words, just for them. Ergo, I will not receive a free meal in exchange for a gratuitous mention from Della’s Coach and Horses. Nor from the Big Hat, at the southwest corner of Moana and South Virginia when that intersection was the south end of Reno (and no, it wasn’t called the White Hat; I’ve been taken down that path before.) Ahh, the Jubilee, at the north end of the grade starting up Washoe hill heading for Carson City, or Hagel’s Villa – known by a host of names but mostly Hagel’s – in Washoe City, east side of 395 just north of Winters Ranch. Great suburban dining when parties were more prone to get out of town a mile or ten for a cocktail. Within that category and I’m surprised no one nailed it this week, was the Christmas Tree – now politically correctly-but-stupidly renamed to “Tannenbaum” by new out-of-town owners here now to help us local-yokels out, gastronomically speaking. [It’s now a banquet affair with BYO food.] They have asked me for a plug, but won’t get it. The Chinese Pagoda got a few votes, down on the north side of B Street in Sparks at what I’ll wildly guess was 4th Street. It later moved to Stoker Drive and into the former Circle RB restaurant, named of course for Reno Browne, where the Pagoda served Chop Suey on Formica tables still with the Circle RB wagon wheel and branding iron pattern. True international dining. Or try the Toscano, on Lake Street for a Sunday family dinner – many were the nights three or four families’ kids went in one private booth for their minestrone soup while our folks had a little red wine in another. Or one could go next door to Columbo’s for Reno’s first pizza, Ralph Festina and his charming wife in the kitchen. [And I heard about the “charming…”] By the way, that Colombo’s was indeed downtown on Lake Street, not the one later on the river (Truckee River Lane) nor the even later one that’s now a Black Bear Diner. The Lancer’s spinach salad (I kind of like Ascuaga’s)…any pastries from PollyAnna’s…Woolworth’s (downtown) grilled cheese with a milkshake…morning coffee at the Eagle Thrifty lunch counter (someone will probably ring in with coffee at Grey Reid’s Bird Cage)…how ‘bout escargot at the Mapes Coach Room? Now then, from the Wigwam, Second at Sierra, hot apple pie with the brandy sauce, which at this writing 473 readers have confided in the past that they ALONE have Les Lerude’s recipe for, but none will share…shrimp scampi at Eugene’s (my vote would be for any of their desserts)…illegally imported abalone at Bill Fong’s New China Club (see reference to the Toscano above – same place, became Fong’s a decade later)…a Wolf burger at the Jot Travis Student Union on the university campus, remembered by all as a burger with a fried egg on the top…Festina’s Pizza, refer to the Columbo reference above; Ralph Festina left Columbo’s to open his own parlor. And took his wife along (she later drowned in Virginia Lake). A toss-up between local Sierra and Tahoe Beer, built by Reno Brewing Company on East Fourth at Morrill Avenue…Chism Ice Cream, anywhere…Steak Diane at the old 19th Hole, capped with a Coffee Diablo expertly mixed by barmeister Jeff Courson. We’ll skip the tale of the local attorney who fried his Rolex trying to mimic Jeff’s expertise with flaming brandy. But we’ll include that Jeff stayed his post alongside Geno Oliver at the Liberty Belle until a week ago yesterday as you read this. Great guys. Space dwindles: Minestrone soup and antipasto at Ric Panelli’s Spaughi’s…a martini at the Glory Hole…got to include a chili cheese omelette at Landrum’s on South Virginia…Shakey’s munch-a-bunch-all-you-can-eat-pizza-and-wings, if the Wolf Burger at the Jot couldn’t get your cholesterol into quadruple digits, and finally, or probably not finally, but sadly, a drum roll please: prime rib at the Liberty Belle.